This weekend is the last dance for an exhibition of Columbia Records album covers directed by John Berg. The show "John Berg" closes today at Guild Hall museum in East Hampton, NY. On view are around 95 album covers spanning 30 years of Berg's career as art director and vice president of Columbia Records. For those remembering having albums and record collections, the show can provide a poignant trip down memory lane. When museum director and chief curator Christina Mossaides Strassfield first viewed his collection in his East Hampton home, memories of growing up immediately flooding back. Berg spent 25 years as an art director for Columbia Records. While there, he was responsible for developing the overall design for some of music’s biggest talents. They include Bob Dylan, Bruce Springsteen, Simon and Garfunkel, Chicago, Bessie Smith, Blood, Sweat & Tears and more. Berg was nominated for 29 Grammys and won four of them. 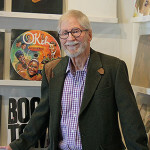 During his career, he designed 5,000 record covers. He was also a vice president for Columbia Records. As art director, he decided whether the album concept would be represented visually through photography, painting, illustration, stock photos, drawing, graphic design, the type of typography and more, said Strassfield. For Berg, he found fun in breaking rules and pushing musicians and those in charge to present album covers that were never done before, he said in an interview at Guild Hall. Bruce Springsteen's "Born To Run" is one example. "The Boss" wanted a serious (and posed) photo to be featured. When Berg was reviewing images taken by Eric Meola from the photo shoot, a fun-loving and spontaneous moment between Springsteen and his saxophonist Clarence Clemons catch his eye. The image captured Springsteen's rock star quality that he hadn't achieved yet, said Berg. Berg kept lobbying for its usage until he Springsteen agreed, recalled Berg. The image became the cover of the 1975 release. The image stretched across front and back covers--another innovation and battle for the extra use of budgetary funds, said Berg. "Bruce Springsteen: Born to Run" by John Berg. Photo by Durell Godfrey. Courtesy Guild Hall. Berg told similar stories of his selecting photographs that weren't even on the list of possibles by recording artists. Tassels between talent that Berg ultimately won included covers for Bob Dylan, Barbara Streisand, Thelonious Monk and others. In some cases, it was Berg himself who was the photographer. "Bob Dylan's Greatest Hits" by John Berg. Photo by Durell Godfrey. Image Courtesy of Guild Hall Museum. Examining the collection of album covers, Berg's subtle artistic voice begins to strike. His "signature" is not found in any visual continuity but in the intellectual underpinnings used to create the visuals that would represent the music inside. Sometimes connections were made between artist, popular culture and the cover. For Charlie Byrd’s album, “Byrdland,” Berg drew tiny bird to represent notes on a musical staff. For “The George Benson Cookbook,” members of the group posed with classic kitchen appliances, he said. Other times, he threw down intellectual gauntlet for music lovers. For the group Chicago, Berg developed a distinctive logo for their name. He used the same compositional placement for all their covers, he said. The size of the band's name also remained consistent. He waited to see if anyone would catch on and remark. No one ever did, he said. "Chicago VI" by John Berg. Photo by Durell Godfrey. Courtesy Guild Hall. Hanging out with musical talent and developing album covers (and having the budget to do so), was a dream job, said Berg. The exhibition proved to be a popular one, said Strassfield. It was extended twice because of it. "Charlie Christian: The Genius of Charlie Christian" by John Berg. Photo by Durell Godfrey. Courtesy Guild Hall. Bessie Smith "Any Woman's Blues" Art Direction by John Berg. Photo by Durell Godfrey. "Thelonious Monk: Underground" by John Berg. Photo courtesy of John Berg and Guild Hall. "The Byrds: Fifth Dimension" by John Berg. Photo by Durell Godfrey. Courtesy Guild Hall. Blood, Sweat & Tears "Mirror Image" by John Berg, 1974. "Blue Oyster Cult" Art Direction and photography by John Berg. BASIC FACTS: "John Berg" remains on view through Feb 24, 2013 at Guild Hall, 158 Main St, East Hampton, NY 11937. www.guildhall.org. RELATED STORIES: New York Times: "Exhibition at Guild Hall Focuses on Album Cover Artist" by Aileen Jacobson. Published Nov 25, 2012. Hamptons Art Hub: "Album Cover Art Directed by John Berg" by Pat Rogers. Published Oct 26, 2012. AIGA: "Across the Graphic Universe: An Interview with John Berg" by Paul Nini. Published October 30, 2007.
at sharing, and with encouragement, which led me to buy my first 35 mm camera in 1969. Columbia Records was truly the place to be during that explosive era of musical experimentation and expansion, and John was the bright light that made so much of that visibly compelling and enjoyable. some of the inside stories of those classic images and graphics were created.